Cryotherapy is an important field in orthopaedics and trauma surgery, particularly during the postoperative phase. It is recommended in virtually all applicable textbooks and publications. Hilotherapy is the optimal form of Cryotherapy, allowing precise temperature control and consistent targeted delivery to the site of treatment. Pilot study to compare effectiveness of two treatment methods, continuous cooling and lymph drainage. Hilotherapy can therefore be used in place of traditional manual lymph drainage on a 1:1 ratio, saving the therapists valuable time. In older patients in particular, e.g. with polyneuropathy, conventional cryotherapy measures using ice bags, "Cryo-Cuff" or so-called cold packs are often problematic, since improper application may result in anything from cold damage to the formation of necrosis. Another common problem emerges with application due to using leaking ice water bags or slippage of the cold packs, which increases the strain on nursing staff. 192 therapeutic applications were standardised and recorded via questionnaire. The therapy was administered in a standardised form for 20 minutes at a temperature of 10-15°C. Corresponding sleeves were used, depending on the area of application. In 164 cases, pain intensities were reportedly lower after the therapy than before it. The average pain intensity on a visual analogue scale declined from 4.9 before the first therapy to 1.6 after the final therapy. Throughout the entire observation period no complications or incompatibilities were observed. No patient was forced to abandon the cold therapy due to intensified discomfort. “Very pleasant, I don’t need any more painkillers." “Redness and excessive warmth on the left declining, pains also subsiding." “Redness easing, but knee still overheated." “The cold is very soothing in countering the ever-present swelling." “I don’t need any more painkilling drip." “With a motorized sleeve and the cooling device, the hematoma can be eliminated more rapidly." "Pain relief around 20 minutes after the cold is applied." “Although the cold sensation was unpleasant at first, it improved later." “By using Hilotherapy on patients who have undergone surgery, we achieve an optimal result. The patients find the therapy very pleasant. Post-operative swelling, haemorrhages or the formation of haematomas are clearly reduced through use of this therapy. 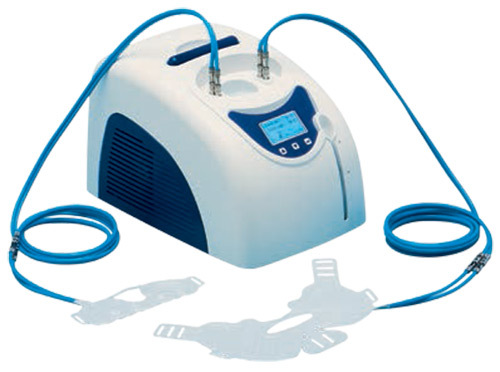 "I have started using the Hilotherapy on patients undergoing elective foot surgery and the initial responses are very favourable. The early anecdotal view is that there is a reduction in pain post-operatively. The patients report that the device is very comfortable to wear and the staff have found the machines much easier than the Cryocuff devices that we have used previously. I would strongly support Hilotherapy for your patients. For the record, I have no financial involvement in the company nor the device." 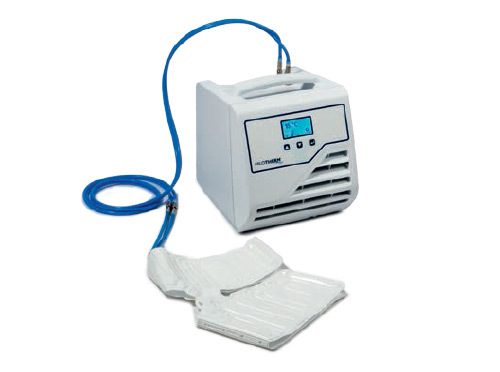 "Having used cooling devices on my patients undergoing knee surgery for some time I was delighted to finally come across Hilotherm, a system that maintains a reliable and reproducible cool temperature without continuous ice changes. The cuffs are comfortable and help significantly reduce pain and swelling following surgery. The patients also like to take home the portable device and it is often difficult to get them to surrender the machine back! So convinced am I of this new technology that we are trialling the machines as a pre-eptive analgesic to reduce pain and subsequent length of stay; it appears to be dong the trick at the moment." "As a designated specialist clinic for minimal-invasive joint surgery, early rehabilitation of the patient as quickly as possible, is one of our main concerns. Therefore the immediate postoperative cryotherapy is of high significance in our clinic. For about a year now Hilotherm is used for cryotherapy. The already relatively short rehabilitation times, because of the minimal-invasive surgery techniques, have been improved again through Hilotherapy. The constant temperature also when a bandage is applied, the patient comfort and the reduced strain on the nursing staff are the main advantages compared to the use of cool packs for example. Especially with complex, reconstructive arthroscopic procedures like the hip arthroscopy, rotator cuff reconstructions, cruciate ligament plastics, etc. The various special cooling cuffs can be fitted exactly to practically all joints, so that an efficient cold treatment can be effected. One of the most frequent procedures done in our clinic is the arthroscopy of the hip joint. This complex procedure offers a lot of advantages to the patient as a hip osteotomy or endoprothesis can often be avoided. Because of the complexity of the joint, the arthroscopy of the hip joint is time-consuming and therefore can lead to considerable postoperative swelling compared to arthroscopic procedures on other joints. Through consequent therapy with Hilotherm, this state of swelling can be eliminated rapidly, so that a quick rehabilitation is possible." "By using hilotherapy on patients who have undergone surgery, we achieve an optimal result. The patients find the therapy very pleasant. Post-operative swelling, haemorrhages or the formation of haematomas are clearly reduced through use of this therapy. Hilotherapy is an inherent part of our clinic and is indispensable when it comes to the optimal care of our patients." "In our clinic Hilotherapy has proven its worth especially in knee and shoulder surgery. The patients find the “gentle cooling“ with the possibility to control the temperature by themselves a lot more comfortable than a treatment with ice packs, which are too cold in the beginning and then warm up quickly. Our experience using Hilotherapy so far is that there’s significantly less pain and the patients recover quicker." "The use of Hilotherapy is great supplement for postoperative treatment of orthopedic procedures to improve the healing process. The results compared to conventional cryotherapy are more efficient and lead to a lower need for postoperative analgesics." "We have been using the Hilotherapy system for a year now. The main areas of applications area in pre-operative as well as post-operative swelling of the lower extremities, the shoulder and post orthognatic surgeries. The patients are extremely satisfied with the pain relieving effects. After initial application by qualified personnel the device can be completely operated by the patients themselves. We now include Hilotherapy in most of our treatments." "The following aspects make the system interesting for me: constant, gentle cooling with reduction of swelling and pain, especially after bone and soft tissue surgery to the head. Saving of analgesics and at the same time a reduction of the side effects associated with analgesics. High acceptance of the treatment by patients and nursing staff." "We are using Hilotherapy with great success pre and post-operative for procedures on joints. The impressive results of improved lymphatic drainage significantly help and impress our patients."